1918: Covers (2) with philatelic frankings, one with 1918 50 sh. red and Russia imperf. 3 k. rose Arms issue pair, 5 k. Fiscal and nine Postal Savings 1 k. red on buff used to Tomeln, also a fine registered cover with 1918 10 sh., 20 sh. in combination with Trident ovptd. stamps (14) tied by RYLSK (Kursk Gub.) datestamps and used to Tworgau, Germany. The latter cover signed Seichter and Bulat. 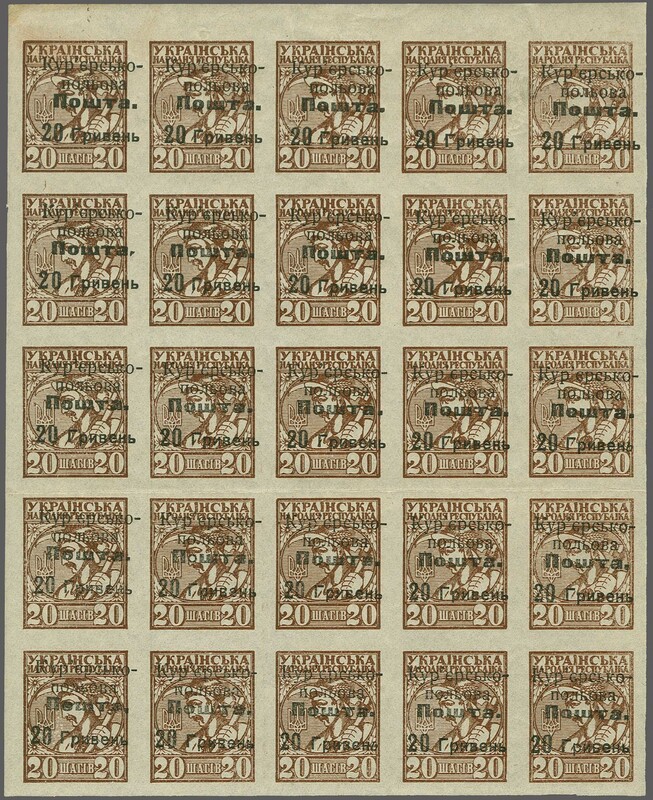 1919 (Jan): 20 hryven vermilion on green paper, a vertical sheet of 80 stamps (16 x 5), folded between eighth and ninth rows, with large margins all round and requisition sheet number 373 at top right in black. Fresh and fine, unmounted og. A scarce multiple Bulat 2544 / Scott = $ 800. Note: The sheets were three panes of 80, two horizontal and one vertical. Only the latter pane had the sheet requisition number. 1919 (Jan): 20 hr. 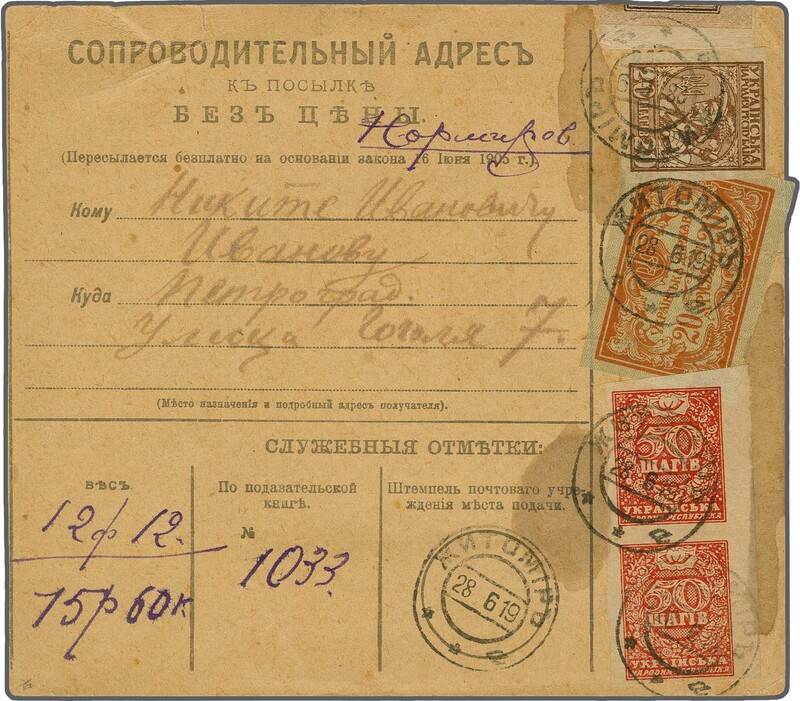 vermilion on green imperforaate, three examples (one on reverse) on Money Transfer Form for 3'000 roubles from Dzhuryn to Sharhorod, all tied by fine strikes of DZHURYN / 20.1.19 datestamps in black, the franking being 1% of the amount transferred. Usual insignificant bends to card, but rare and very attractive - believed to be the earliest recorded use of this adhesive Bulat 2544. 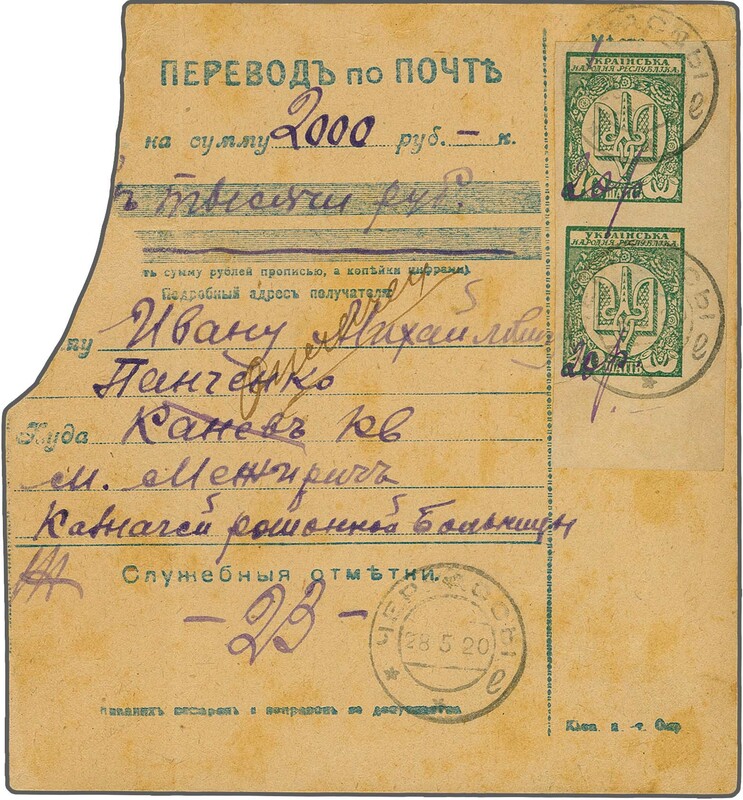 Cherkasy Provisional 1920: Money Transfer Form bearing 1918 40 sh. green in an imperforate vertical pair used from Cherkasy to Kaniv, each stamp with surcharged "20 p." (roubles) in violet ink manuscript and tied by CHERKASY / 28.5.20 datestamps in black, representing a 100 tiems face value re-evaluation to pay the 2% increased Money Transfer fee; the card slightly truncated at left. Also a small piece bearing 1918 10 sh. 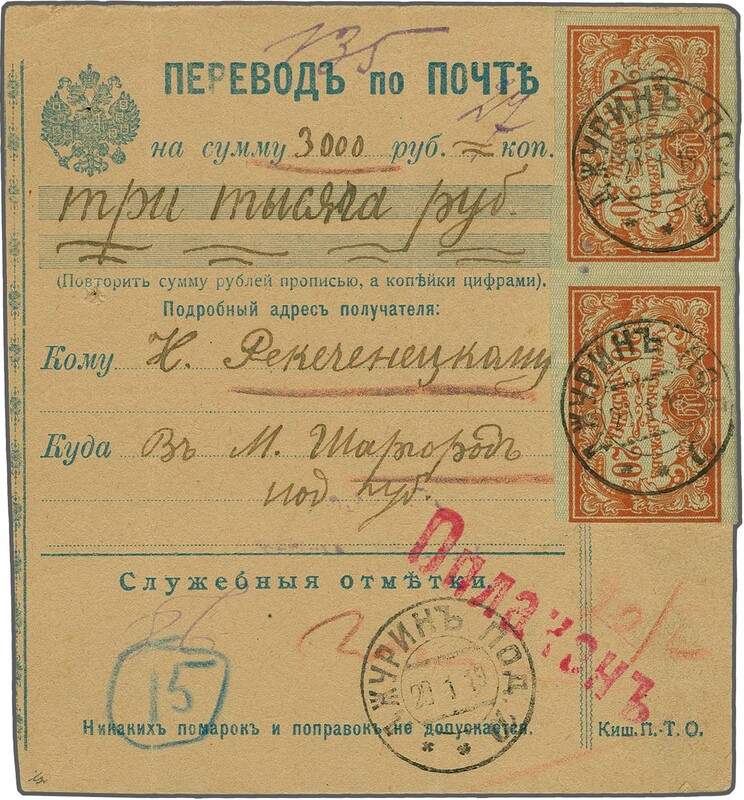 buff vertical pair surcharged "5 p." (roubles) in violet ink manuscript tied by Cherkasy cds (April 26, 1920). Rare provisionals. 1920: 10 h. ovptd. in black on 10 sh. 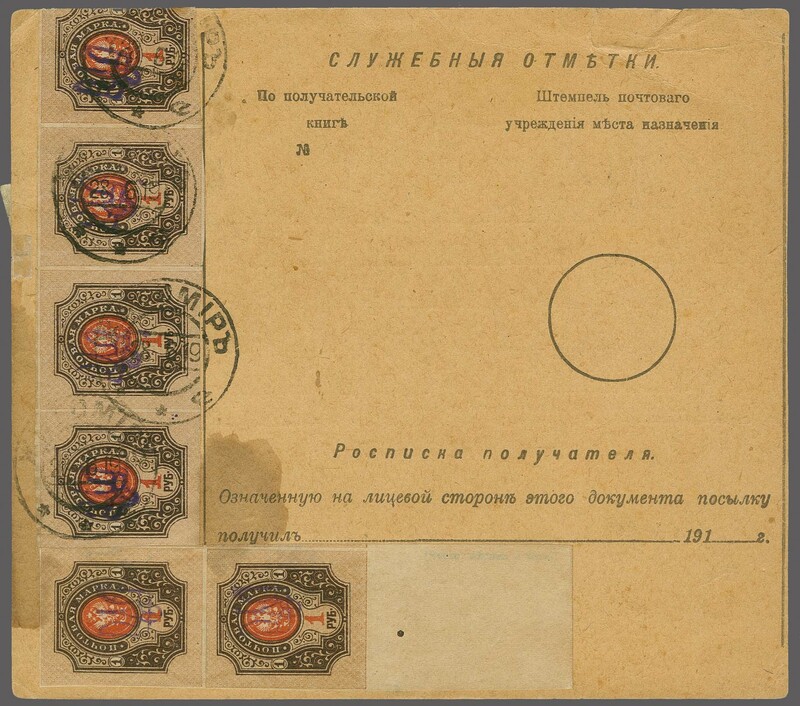 buff, a complete mint pane of 25 (5 x 5), large margins all round, showing all the sub-types of the surcharge with position 15 and 23 showing italic 'b' at the end of Cyrillic 'hryven', thin 'o' in 'Posta' on position 17 etc. 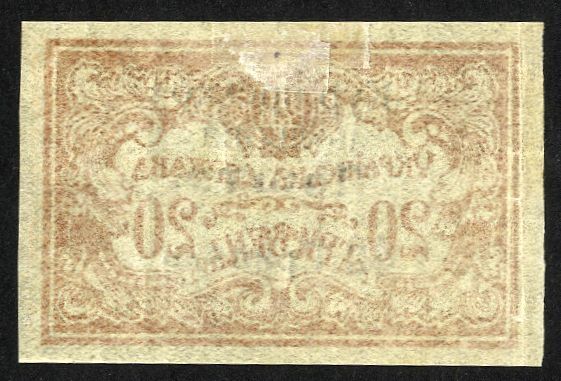 Position 20 with tiny closed tear at left barely noticeable from front and vertical crease between the fourth and fifth rows, typical aging, otherwise fresh and fine with large part or unmounted og. Scarce, with just three full panes of 25 recorded Bulat V11 = 2'000 printed / Scott = $ 500+. 1920: 20 h. ovptd in black on 20 sh. 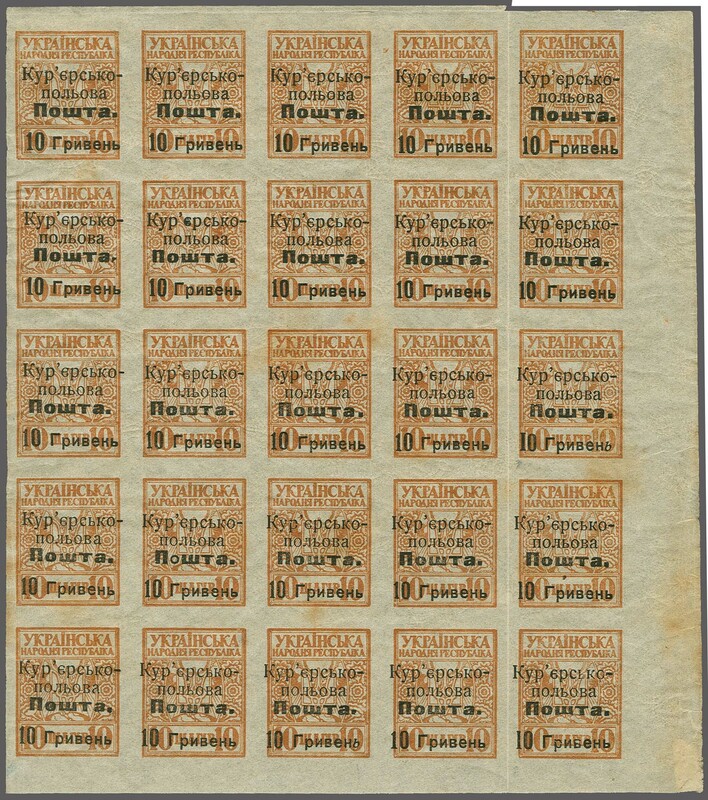 brown, a complete mint pane of 25 (5 x 5), large margins all round, showing all the sub-types of the surcharge with position 15 and 23 showing italic 'b' at the end of Cyrillic 'hryven', thin 'o' in 'Posta' on position 17, and '2' and '0' of '20' widely spaced on position 6 etc. Light horizontal crease between third and fourth rows, otherwise fresh and fine, a superb and rare multiple with full large part or unmounted og., just three full panes of 25 recorded Bulat V17 = 2'600 printed / Scott = $ 375+. 1920: 20 h. overprinted in black on 20 sh. 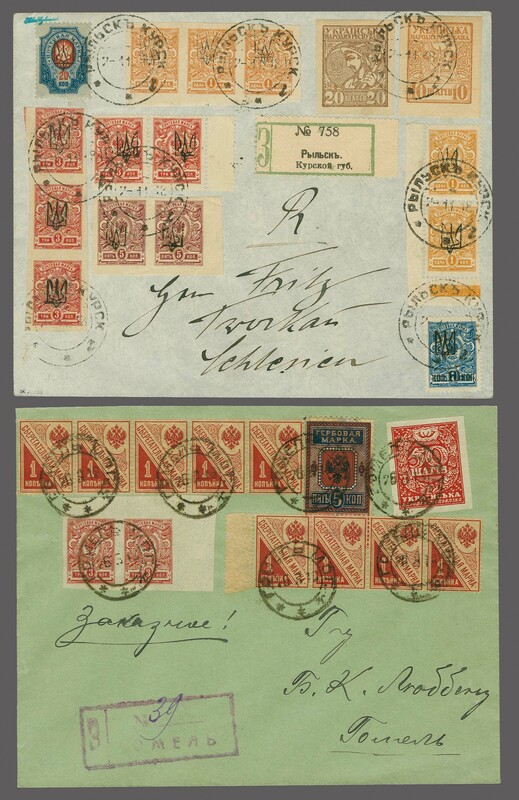 brown, a complete mint pane of 25 (5 x 5), variety 'Surcharge Inverted', large margins all round, showing all the sub-types of the surcharge with position 15 and 23 showing italic 'b' at the end of Cyrillic 'hryven', thin 'o' in 'Posta' on position 17, and '2' and '0' of '20' widely spaced on position 6 etc. Light vertical crease between fourth and fifth rows, minor age stains not apparent on face otherwise fresh and fine, a superb and rare multiple with full large part or unmounted og. Very rare, the sole recorded intact pane with the inverted surcharge variety Bulat V17a / Scott = $ 1'500. 1920: 20 h. on 40 sh. 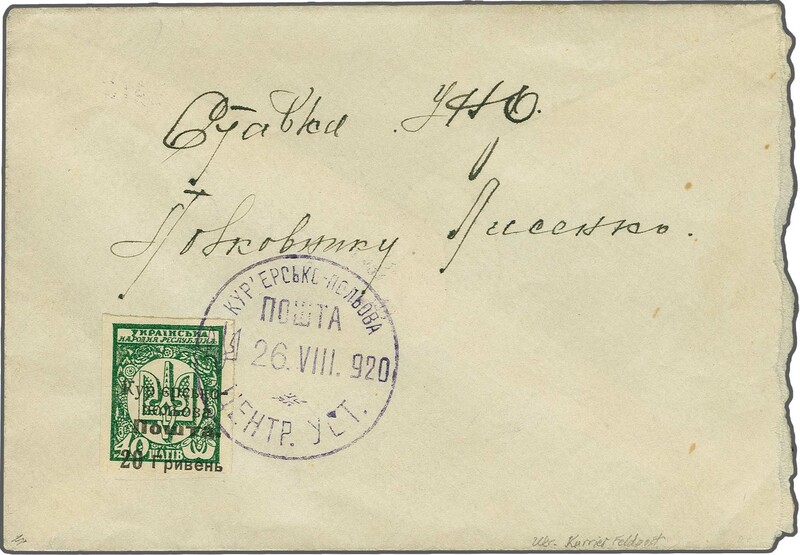 green, a fine large margined example used on cover to Headquarters (Stavka) A, tied by bold circular datestamp (26.VIII) in violet of the Central Office. 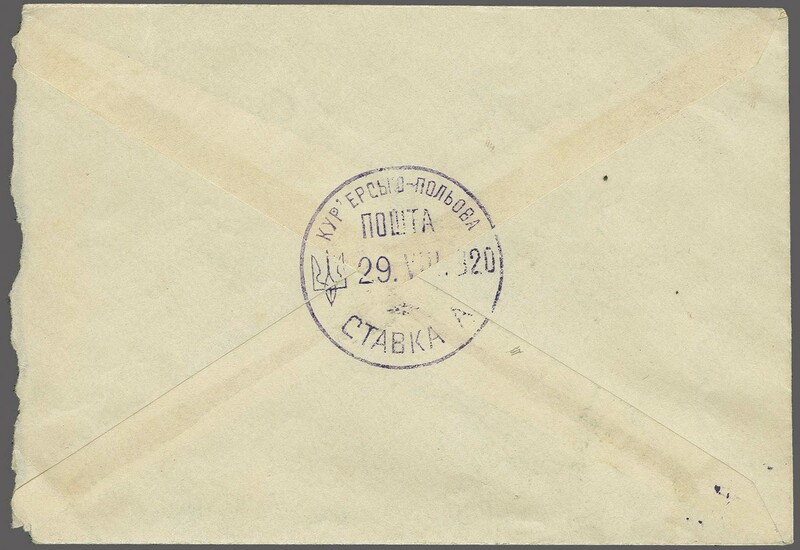 Reverse with Stavka A arrival datestamp (29.VIII) also in violet. A fresh and fine cover in superb quality Bulat V19 = 1'000 printed. Note: August 26, 1920 is the acknowledged First Day of Issue for these adhesives. 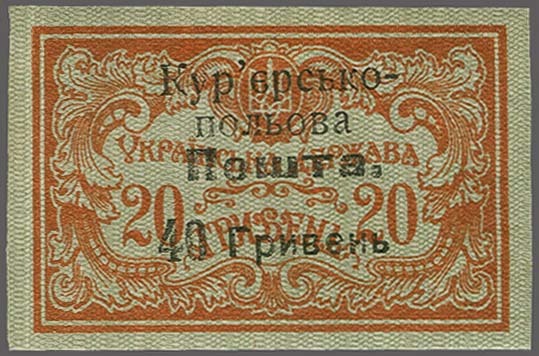 1920: 40 hryven on 20 h. vermilion on greenish paper, mint imperforate example with large even margins all round, of fresh vibrant colour; issued in Tarnow. 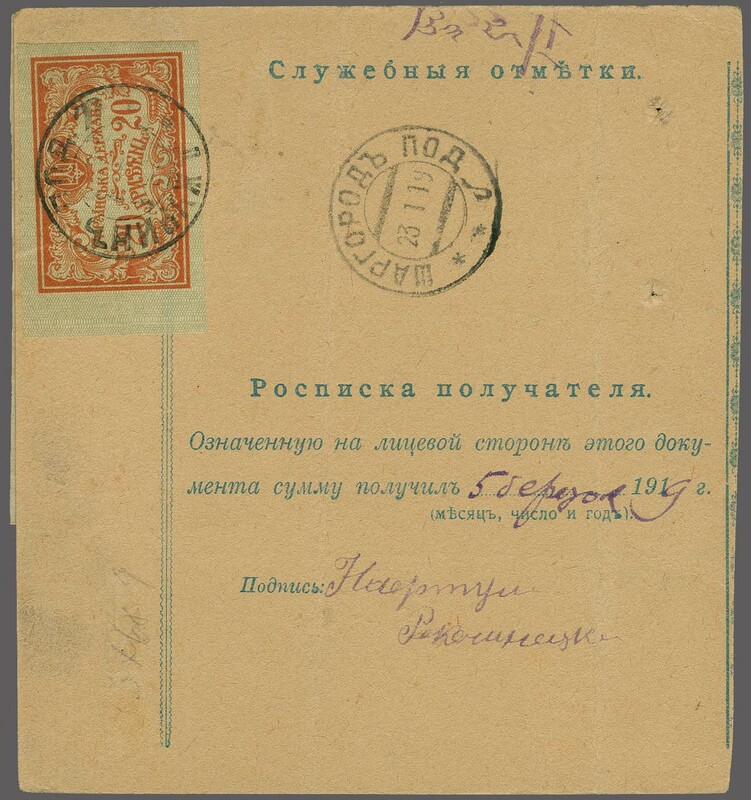 The overprint is identical with position 21 of the setting of 25 used to overprint the 1918 definitive of the Shahiv issue (as is the only other recorded example of this stamp, which is used on cover) and the stamp. A wonderful and extremely rare stamp, lightly hinged and with large part original gum. A photocopy of the original album page is included with the lot, although Roberts states that 15 examples were printed this has now been confirmed as erroneous with just 5 stamps believed to have been ovptd. One of just two examples of this rarity recorded and with impeccable provenance Bulat V26 / Scott M16 = unpriced. Provenance: Collection C. W. Roberts. 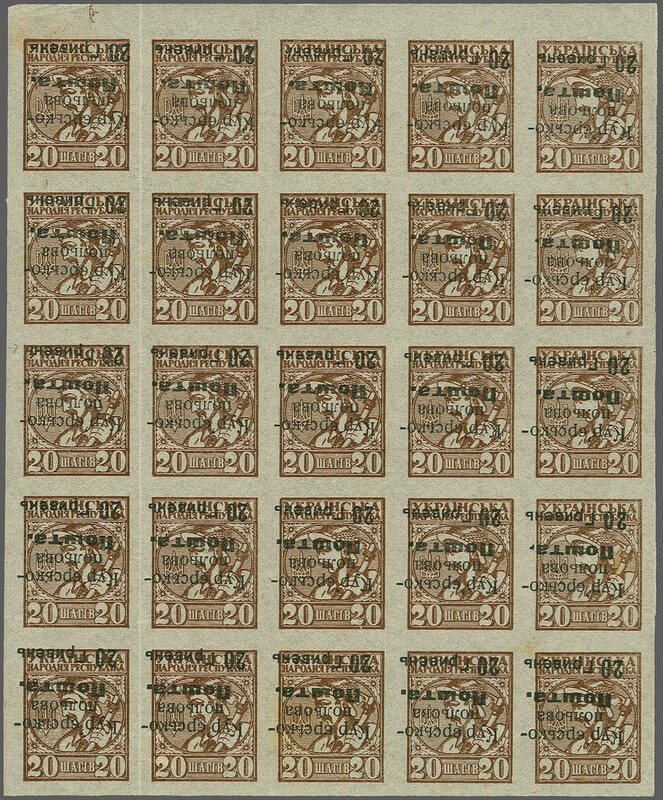 1920: Album page with Surcharged Shahiv Issue mint varieties: including the remarkable 'Off-Set' on reverse on 20 h. on 10 sh. buff (unrecorded), 'Inverted Surcharge' varieties on 10 h. on 40 sh. green, 20 h. on 20 sh. brown, 20 h. on 30 sh. ultramarine (pos. 5), 20 h. on 50 sh. red in a block of four, 10 h. on 10 sh. with 'Inverted & Misplaced Surcharge', further misplaced surcharges on 10 h. on 10 sh., 10 h. on 40 sh. green pair (pos. 11-12) and a single, 20 h. on 20 s. brown pair, 20 h. on 30 s. pair (pos. 24-25), 40 h. on 10 sh. buff pair, 40 h. on 20 s. brown pair etc. 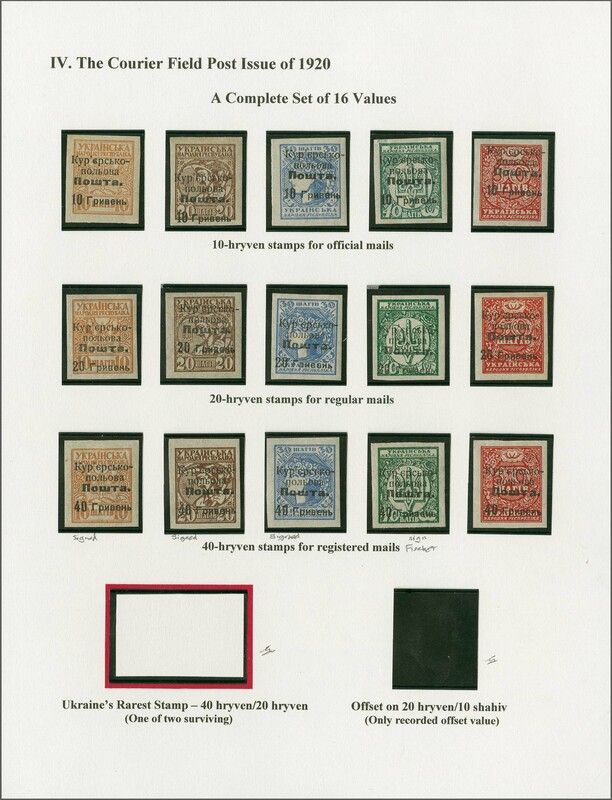 A splendid page with very rare varieties Bulat V11a+V14a+V17a+V18a+V20a. / Scott = $ 2'100+. Note: It is unlikely that any of the Inverted Surcharges of this set were issued in quantities above 100 stamps. 1920: The complete mint set of 15 values imperforate, issued at Tarnow by the Ukrainian Government in Exile, with 10 h. values (5), 20 h. values (5) and 40 h. values (5), each on the five different July 1918 values of Ukraine. Fresh and very fine set, all with large margins all round, of fresh colours and large part og., with just 100 full sets possible Bulat V12/V25. Scott = $ 1'700+.